Memories can be kept frozen in time using your Android. Nowadays, latest mobile devices have features that allow you to a lasting record of the most beautiful things, places, people, and events. Parents love to take videos of their child's first step, first birthday, first day in school, and other occasions that your child would someday like to watch. How would you feel if by accident, you lose them? To those who do not have any backups for their videos, this could be a great disaster. Is there a way of recovering those precious videos you have kept for years? The answer is Yes and but you should figure out why it can be recoverable. As a matter of fact, if you empty, format your phone's memory, or delete precious movies by accident, the space in which the videos were saved is not erased essentially and still was stored physically on your Android memory system and not re-used immediately. Instead, that space was occupied by the data becomes available for re-use. This is the data storage principle and this is why the deleted videos from Android phone still have the chance to be recovered. To restore deleted videos from your Android phone safely and high success rate, you may consider to choose a professional data recovery service company, but your private data will be risk and recovery process is very long. We highly recommend to choose professional recovery software and do it by yourself. Android Data Recovery program is designed specially to recover lost videos on Android device, it is most effective at locating the lost data so that the files can be undeleted or unerased. 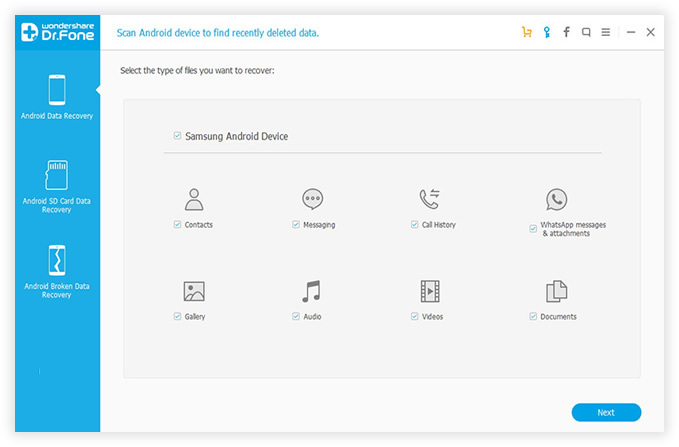 Users need to download and install applications on their own computer by the default wizard, then connect your Samsung Galaxy phone with your computer via its digital cable. As you can see in the following graph. An important thing that you should enable the USB debugging on your Android phone so that your phone can be easily recognized by the program. 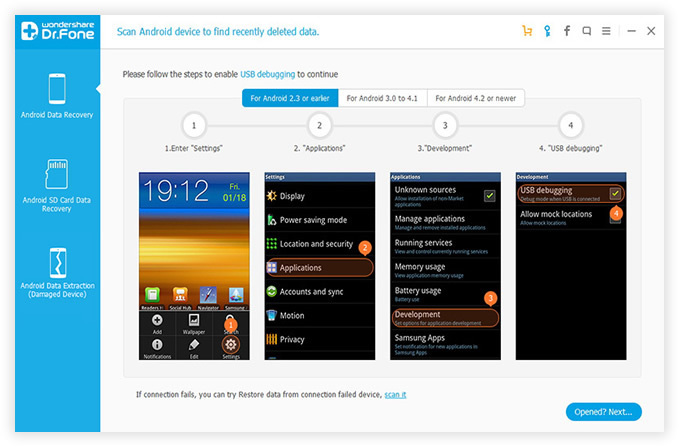 For different versions of Android OS, follow the details below..
For Android 3.0 to 4.1: Go to Settings < Developer options < Check USB debugging. After your phone was recognized successfully, you need to press "OK" button when a message pops up on the device's screen. It will allow the program Superuser authorization to analyze your Android phone. 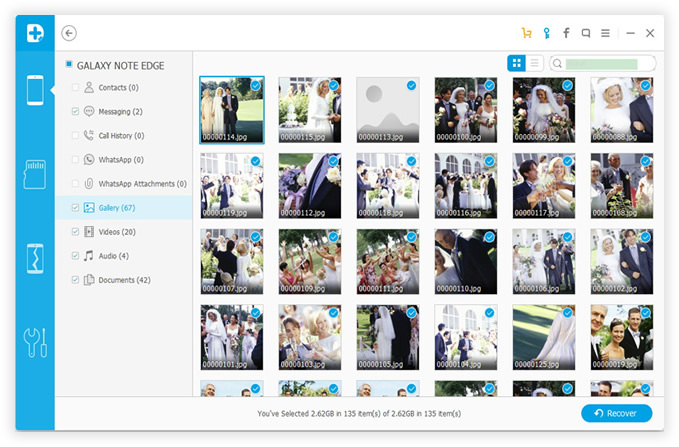 Select "Videos" from file types and "Standard mode" in next. In this step, the program will now scan your phone's internal and external memory, when it has finished, in the result window, click "Videos" in the left sidebar, it will display all the recovered files including videos, photos, contacts, messages and more... You can see a preview of any files. After then, check the videos you need and click the "Recover" button to recover deleted videos to your computer. 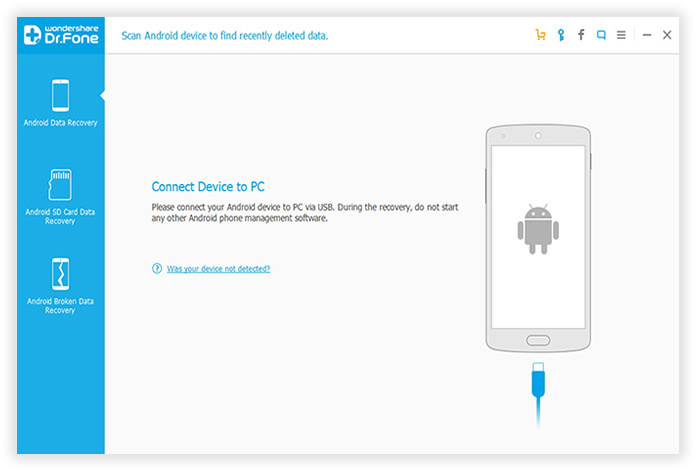 This Android Videos Recovery software acts like a doctor in the sense that it makes a diagnosis of what is wrong with your device, it gives you more options to recover many data types, this program was supported by almost all phones and networks so that you can make use of it regardless of the model of your device. The Editor suggests that you should stop using your Android phone while you realized the data lost, Otherwise, it will overwrite the original “Space” and wrecking your chances of recovering them.